Hardy. Versatile. And Modern. Wire shelving is a durable and flexible solution for multiple areas of your home. The smooth, tarnish resistant chrome finish is easy to clean and looks great in any environment including garages, kitchens, pantries, laundry rooms and walk-in closets. In the kitchen, they add an industrial look that can really compliment your stainless steel appliances. In the laundry room or garage our wire clothes racks can be paired with wire shelf casters to add portability and mobility to your storage unit. Shelving for clothes come in a wide variety of selections that is sure to compliment your home while fitting your wire clothes rack needs. One of the best things about wire shelving is that even when it’s loaded up with clothes, shoes and bags, they still lets in a lot of light. With a wire clothes rack, your items remain accessible and organized. You don’t need to have a ton of wall space in order to add wire shelves. 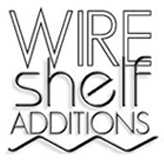 Wire Shelf Additions has small-scale solutions ideal for compact areas. Use wire storage racks and combine multiple shelves, clothes bars and accessories to create the perfect shelving for clothes and laundry. Our wire clothes racks are available in a selection of sizes and styles to fit your exact requirements. Height adjustable shelves allow you to accommodate items of various shapes and sizes. The open air design and bright finish of our of wire clothes racks allows for cleanliness while minimizing dirt and dust build up. The chrome finish on our wire clothes racks improves lighting, providing increased visibility making clothes and products easier to spot. This makes chrome wire clothes racks truly lustrous and modular. Wire shelving, garment racks, laundry sorters, and other wire rack accessories come in a flat pack and assemble in minutes, without the need for tools. Effortless assembly and disassembly makes the wire shelving easy to transport or store away when not in use.